My friend Alex sent me an email a few weeks ago with the subject line: “new obsession”. Alex and I have very similar tastes in food and she is also not one for melodrama, so I knew this was an email I was interested in reading. She proceeded to write: ” I have a new obsession. 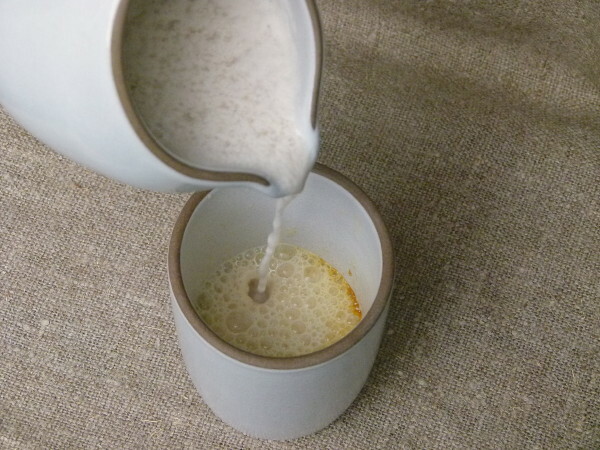 Full out obsession” with the recipe for a delicious-sounding “Turmeric Tea.” Thank you, Alex! Right up my alley. Print! I don’t know what has taken me so long to wind down an evening, any evening, with a cup of warm, anti-inflammatory turmeric tea or latte. It’s everything I love — soothing, nourishing, delicious and might even help me sleep better to boot. The same day I received Alex’s email, a text came through from another girlfriend, whose husband was instructed to follow and anti-inflammatory diet. “Can you tell me what foods are anti-inflammatory? Need to get on this pronto!” First thing I wrote back was … turmeric. I love turmeric in curries, stews, juices and I even add it to my homemade taco seasoning. Because turmeric runs bright, flaming yellow, I also use it in place of saffron sometimes (like in Mediterranean fish stew and paella.) It is truly one of the most healing, powerful foods on earth. I already mentioned turmeric’s anti-inflammatory properties, but it is also an antioxidant, wound healer, digestive stimulant, liver detoxifier, helps to lower cholesterol, and has a warming thermal nature. I use fresh turmeric in juices, and ground in everything else for practical reasons. Turmeric has a very distinct, but mild flavor. Since it is related to ginger, it does have a faint hint of ginger, but also a bitter, tart, chalkiness, too. A little is nice, but a lot can be offensive. It also stains like crazy — from clothing to countertops — so be careful! Since Alex’s email, I have made this beverage many, many times and guess what? I’m OBSESSED! It’s my new favorite drink, just in time for winter when I don’t really drink cooling juices as much. 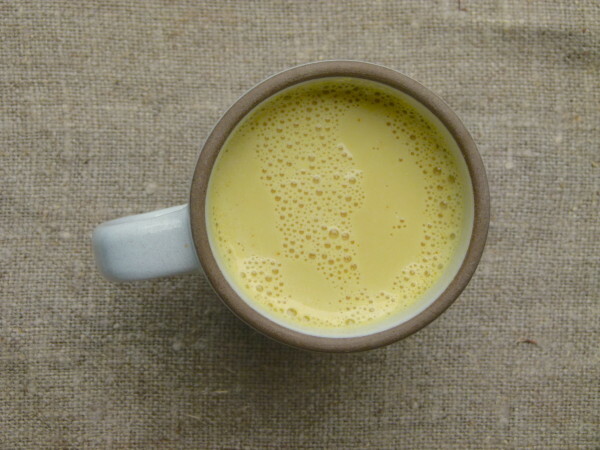 However I’m calling this a Turmeric Latte, since the base of it is milk. I use almond milk, because it’s my go-to and I always have homemade on hand. 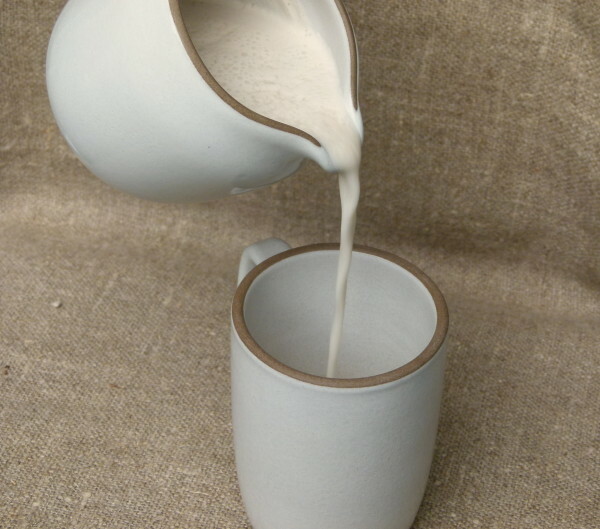 Of course you can use regular milk or your favorite alternative milk, or a combo of milks. I recently started playing around with adding a little cashew milk to almond to add a thick, creamy richness. More on that another time! 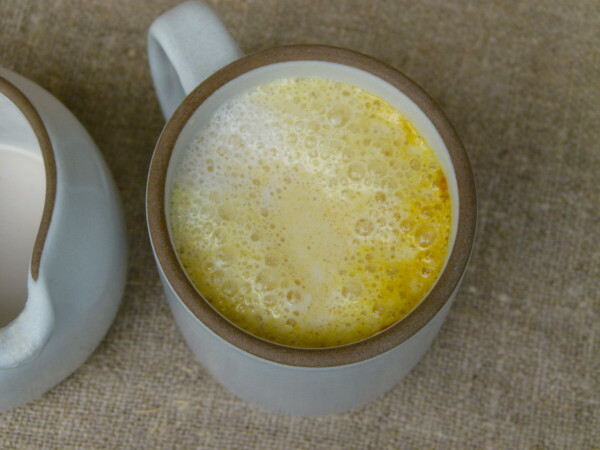 This turmeric latte is beyond delightful and the perfect way to settle into a restful evening. It is also quite easy to prepare and you might even have all the ingredients on hand. I would start with the basic recipe below and then change it to suit your taste/needs. For example, it would be perfectly easy to use a few drops of stevia to sweeten instead of the maple syrup. Or a couple pinches of ground ginger instead of fresh. If you love turmeric, feel free to add more. As we near the end of 2014, I know many of you have resolutions of better health and adopting new habits on the brain. 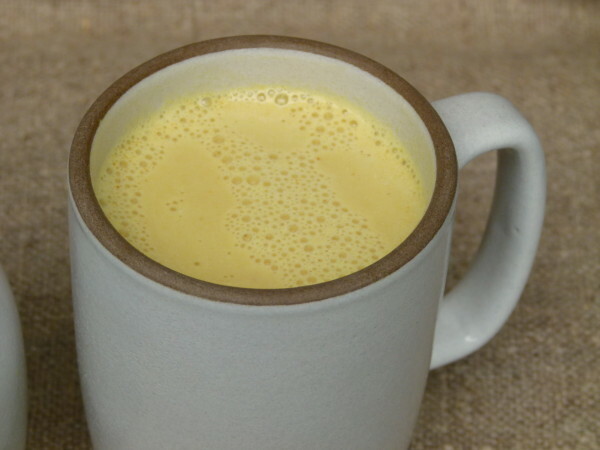 I hope this post catches you in time, as I think drinking a turmeric latte a few times a week is a resolution I can stick to. How about you? 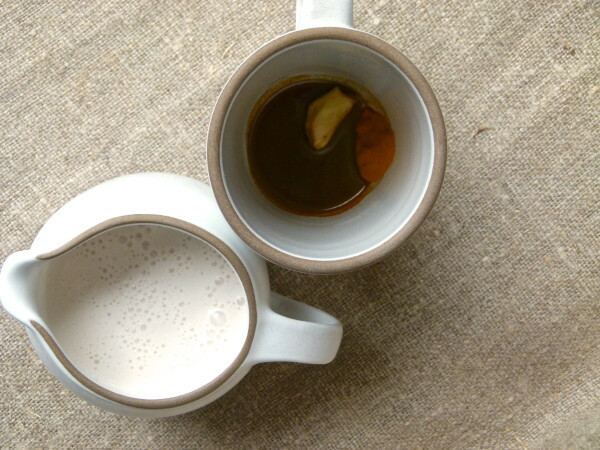 Place turmeric, maple syrup, cayenne, and ginger in a mug. Pour in warmed almond milk. Stir and allow to steep for a minute. Enjoy! Feel free to use this recipe as a base for your latte, then add other spices or more/different sweetener to taste. This looks amazing!!! I will definitely try it! We love your recipes. You truly have impacted our family in so many positive ways: more organized when grocery shopping, feeding husband and two small children healthy delicious food, being able to quickly put a yummy dinner on the table after a long day at work, etc. Now quick question: what is your favorite frother ? Your cappuccinos always look so delicious. Thank you!! Thank you, Maria. Your comment made me so happy :). I have an old Nespresso aeroccino. I imagine the new model works as well. I like it because it heats the liquid at the same time. There are also frothing wands that you can use in a mug of already hot liquid. I have one of those too that I bring with me to work. I just made this for the first time and it is so wonderful! Now I have the perfect idea for a teacher appreciation gift – a mug, your recipe, a piece of ginger, some turmeric and maple syrup. Thank you tenfold!! Hi there. 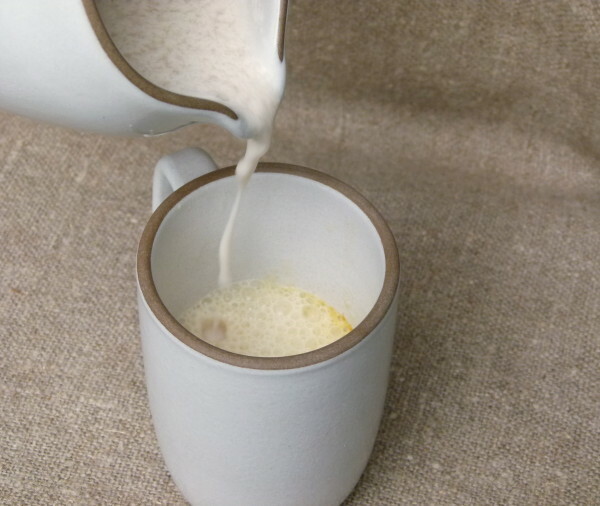 You must add black pepper to your lattes as it contains piperine, which is needed for the bioavailability of Tumeric. Just do a search on Piperine and Tumeric or Black Pepper and Tumeric. The two must go together. Yes, you are absolutely correct. I have learned this since posting this recipe. Thanks for the reminder. I am going to add a note to the recipe. Thank you! I drink teas, but not all of them are caffeine-free, e.g. green tea. I don’t drink coffee, but there is a non-coffee substitute that I think is great. I use Pero in brownies and faux iced blended mochas. It is not gluten-free though. Thank you! The Tulsi with homemade almond milk is pretty good! Enjoy your vacation! I would also suggest meditation before bed. And don’t drink too much right before you go to sleep since waking up to use the bathroom defeats the purpose! Good luck! Just had it with 1/2 coconut milk, 1/2 rice milk + honey, ginger and cinnamon on top, delicious! This is so delicious! Made with homemade almond milk it is just amazing! Thank you for this great idea. 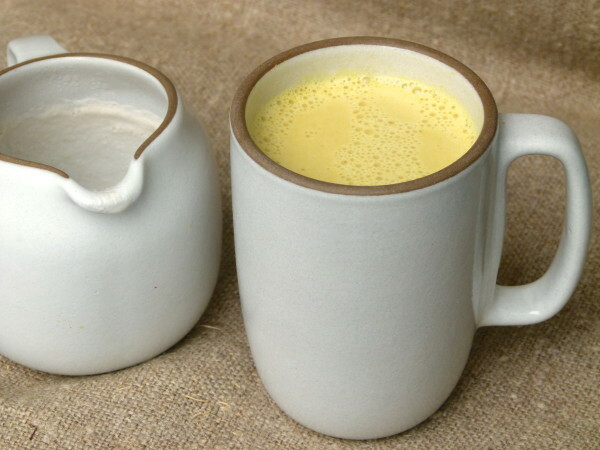 Having the tumeric latte right now…I love it ! If it helps with sleep I will be having one nightly!! Great website and recipes Pamela. Thank you! This is DELICIOUS!!!!! Ohhhh love it love it! I just stumbled upon you during my cruz through Pintrest. Loving your recipes. Hi, Pamela. Wondering if I could use fresh turmeric in this recipe? If so, how much do you think I should use? Thanks! I think you could for sure, but if you are using grated turmeric I would let it steep in the warm almond milk a bit. I would use a standard piece of turmeric which is about 2-inches. 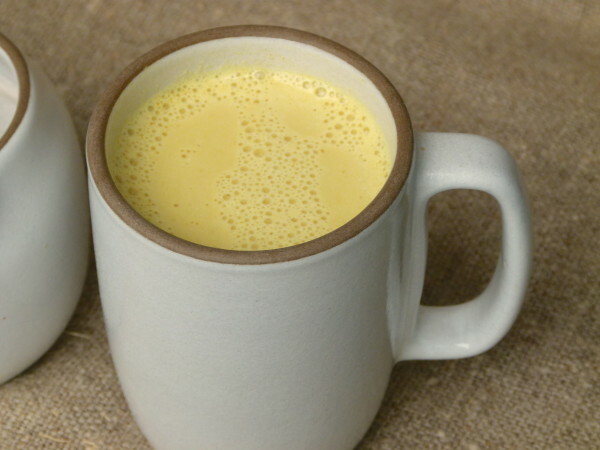 Juicing turmeric is a little trickier since so little juice comes out and you need to follow it with something more watery to flush it out, unless you’re juicing a lot of turmeric. What were you considering doing? I hadn’t thought through it, to be honest. 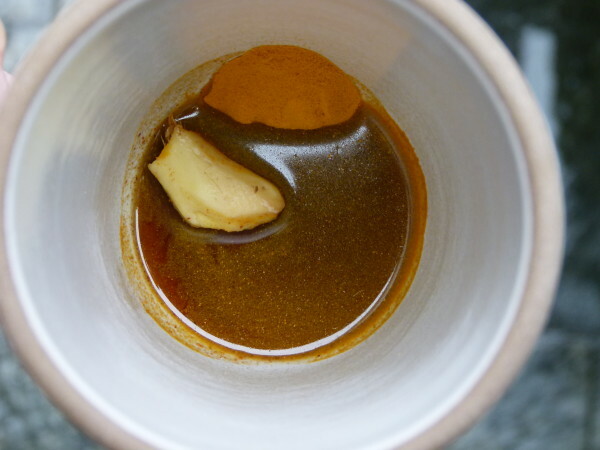 I happen to have a piece of fresh turmeric from making your delicious sweet potato juice and thought maybe I could steep a piece of turmeric along with the hunk of ginger. Guess I’d be more inclined to grate it than juice it if you think that steeping a large piece wouldn’t be very effective. Yes, I would grate it if you’re going to go fresh. Juicing one piece is nearly impossible! Can not wait to try this! Happiest New Year! xo! This morning felt a cold coming on with a scratchy throat. Tried the hot turmeric latte and by afternoon was feeling so much better. So warm and spicy! Yum!